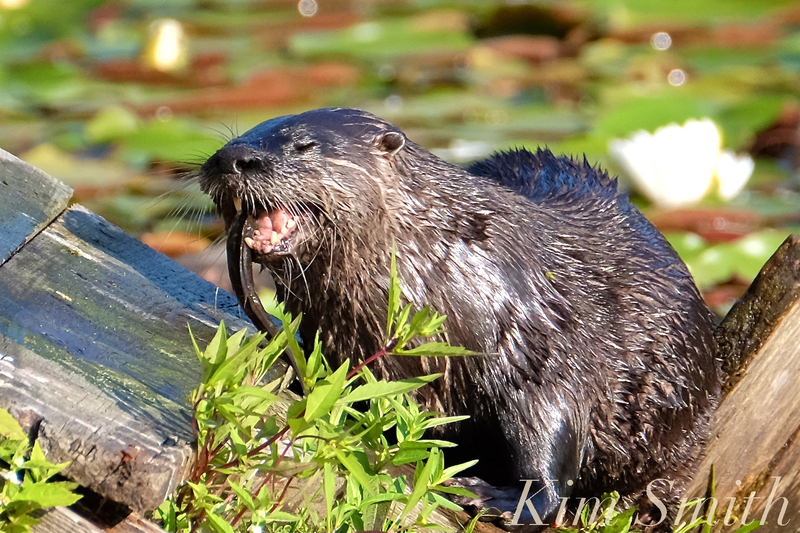 The North American River Otter is making an amazing comeback, not just on Cape Ann and all around Massachusetts, but in many regions throughout the United States. 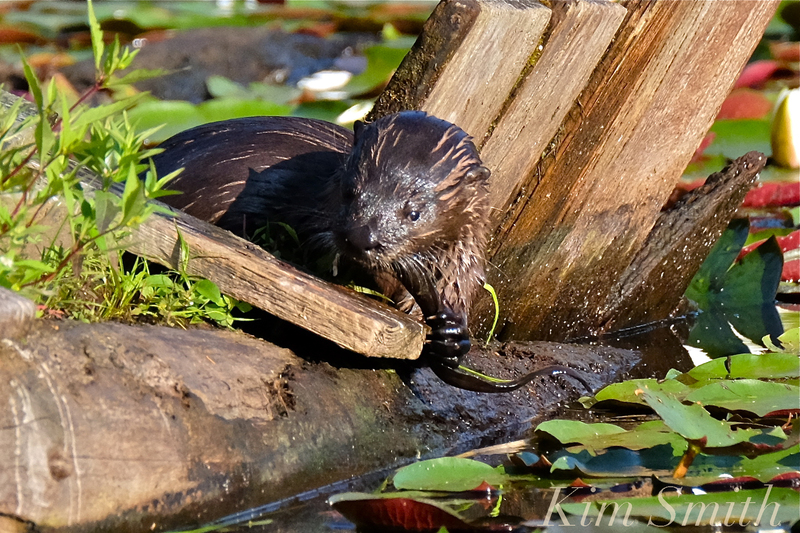 River Otters need unpolluted wetlands, streams, rivers, and ponds to survive, along with secluded places to den. 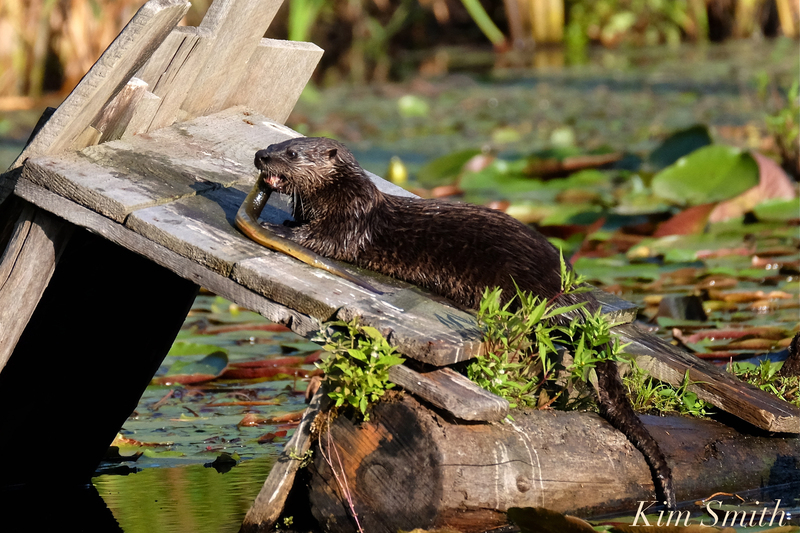 Hollows in the banks of ponds and rivers make excellent dens and so do former Beaver lodges. 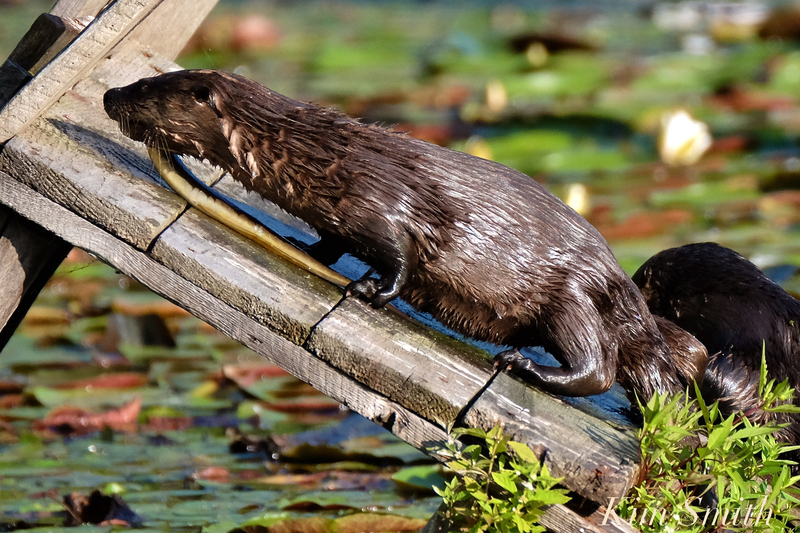 As the perpetually-lodge-building Beaver has returned, so has the North American River Otter. 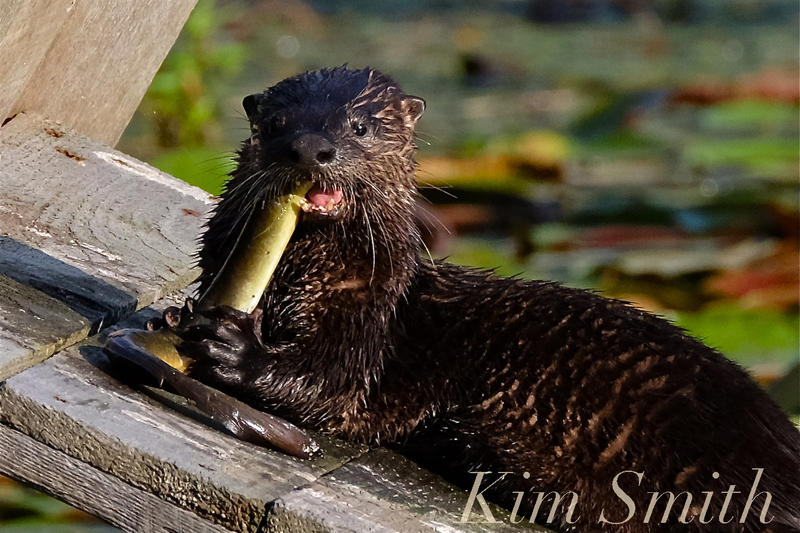 River Otters also need plenty of prey. Locally, they eat fish, frogs, snakes, and EELS! This summer over in West Gloucester there appeared to be two Otter families, one mama with three pups and another mama with four pups. After watching the romp of Otters eat tadpoles and frogs early in the summer, by midsummer they had graduated to American Eels. I at first could not figure out what they were doing skirmishing around in the tall grass at the pond bank. Compared to diving and resurfacing with a mouthful of frog, this was entirely new behavior. There was much excited chortling when one of the pups caught an eel, which then seemed to set off a chain of eel ambushing and eating. 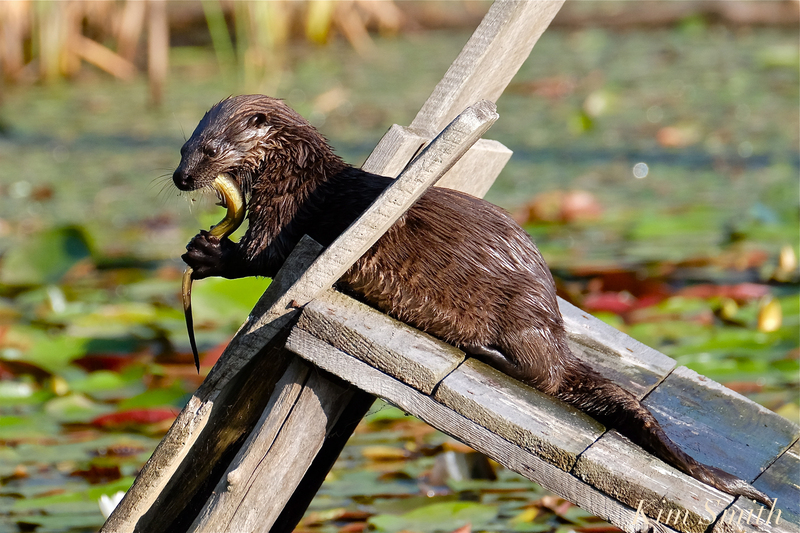 One morning I had the great fun of observing three otter siblings chomping down on an otterly delicious breakfast! First one pup catches an eel and brings it to the old wooden perch, which is also the otters favorite place to play hide and seek with each other. Then the second pup, and soon all three were chowing down on eels! The first one was getting jostled by his siblings and sought out more private room in which to dine. American Eels can grow up to five feet long and weigh as much as 16 pounds. These Eels were about three to four feet long. American Eels spend most of their lives in freshwater and only return to saltwater to spawn and then die. The pups deftly use their feet to hold fast the slippery eel. Photographed on a different day, I think this pup is eating a snake. Notice the tapering tail in the above photo. 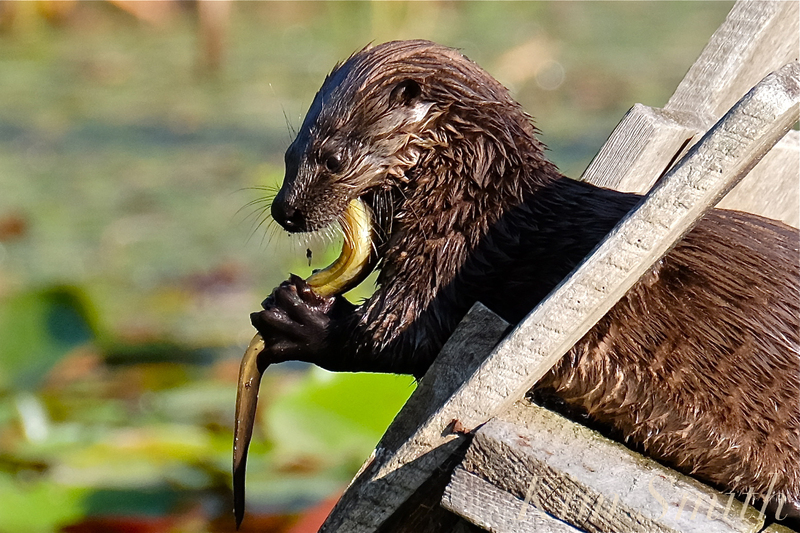 Why is clean water so vital to the survival of River Otters? Pesticides, industrial pollution run off such as polychlorinated biphenyls (PCBs), and mercury are absorbed by the River Otters prey. 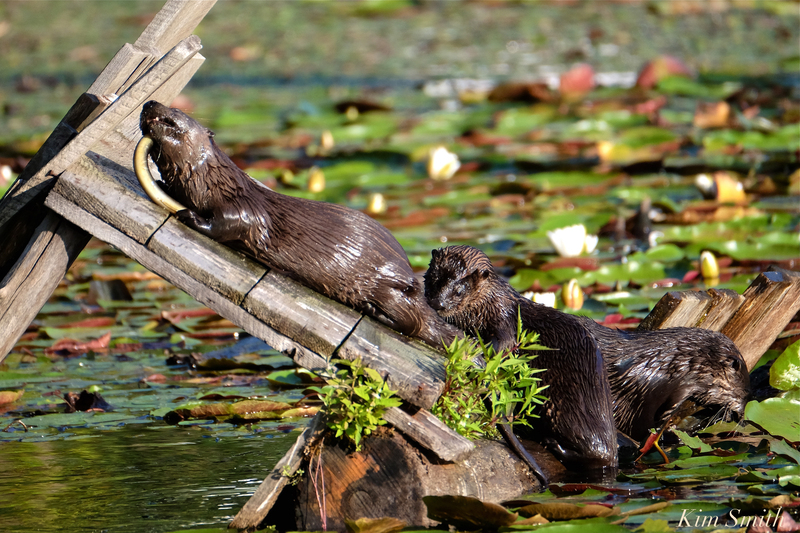 The chemicals accumulate in the River Otters, causing illness and death. This entry was posted in Cape Ann Wildlife and tagged American Eel, American Eels, Anguilla rostrata, crayfish, Fish, frogs, Gloucester, Lontra canadensis, New England Pond Ecology, North American River Otter, River Otter Comeback, snakes, tadpoles, what do River Otters eat? on November 16, 2017 by Kim Smith.